So much to see & do in Washington, D.C.! So much to see and do in our nation's capitol. 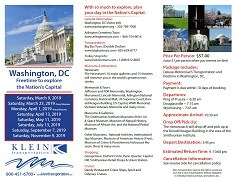 Spend the day on your own in Washington, D.C. and be sure to plan your day using some of the information listed below, as well the websites for each of these locations in the Useful Links. The Newseum's 14 major galleries and 15 theatres will immerse you in the world's greatest news stories. You could spend your entire day here! Jefferson and FDR Memorials, Washington Monument, Lincoln Memorial, Arlington National Cemetery, National Mall, US Supreme Court, Ronald Reagan Building, US Capitol, WWII Memorial, Vietnam Veterans Memorial and many more. 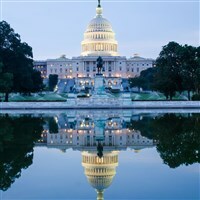 The Smithsonian Institution Museums (FREE): Air & Space Museum, Museum of Natural History, Museum of African Art, and the National Postal Museum, National Archives, International Spy Museum, Museum of American History(Free), Museum of Crime & Punishment, Holocaust Museum(Free) & many more. Drop off in front of the Ronald Reagan Building located at 14th Street NW & Constitution Ave NW - Bus will drop off as close to this location as possible if there is construction in the area. Bus will Depart Washington at 5:45pm from the same location that you were dropped off. - Please check with your tour director for more information regarding this location before disembarking for the day.